In this blog post, I aim to provide an insight into the fascinating coffee journey from bean to cup, as well as some helpful tips to make your cup of coffee taste even better. In this piece, we will look at how coffee beans change from their green lifeless form to the roasted coffee we all know and love. The roasting process is one of the most exciting, interesting and complex processes in the whole coffee industry. During this operation, a dull and lifeless looking green bean is transformed. Aa brown coffee bean with astonishing amounts of different tastes and aromatics emerges. The coffee roasting process has been around for a long time yet every day we are learning more and more. 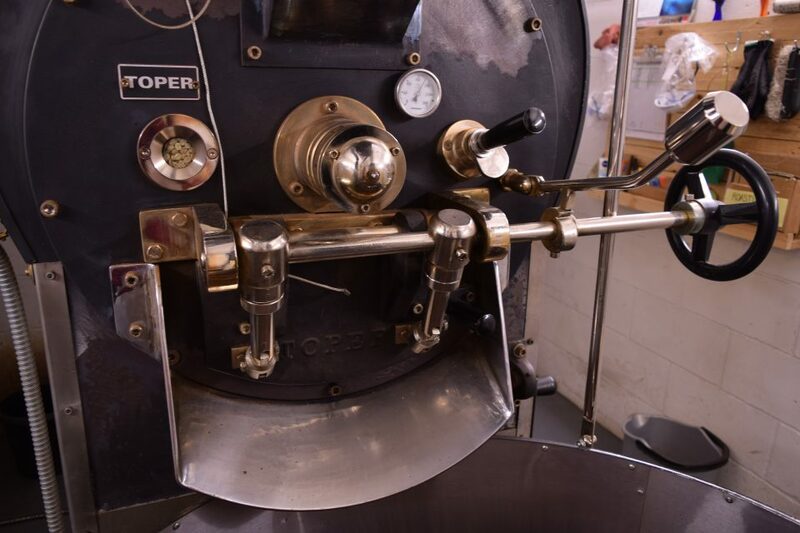 Firstly, when looking at roasting coffee we need to examine the coffee roaster itself. There are a few different styles of roasters; however the most common is the classic drum roaster. It comes in various designs and sizes but essentially, all drum roasters are based around the principle of a cylindrical rotating drum. The drum (like a washing machine) lies above an open flame, (usually a gas burner) and is used to heat the drum as well as the air passing through it. Before roasting the roaster and drum need to be preheated. The timing of this depends on the type and thickness of metal that the roaster and drum are made of. Once preheated, and at a stable temperature, (usually somewhere in the region of 210°c). The green coffee beans will be dropped into the roasting drum. This continuously rotates, tumbling the beans throughout the roast cycle to ensure a consistent roast. The whole process takes approximately 10-20 minutes depending on varying factors including the style of roast, coffee beans, moisture, roaster etc. 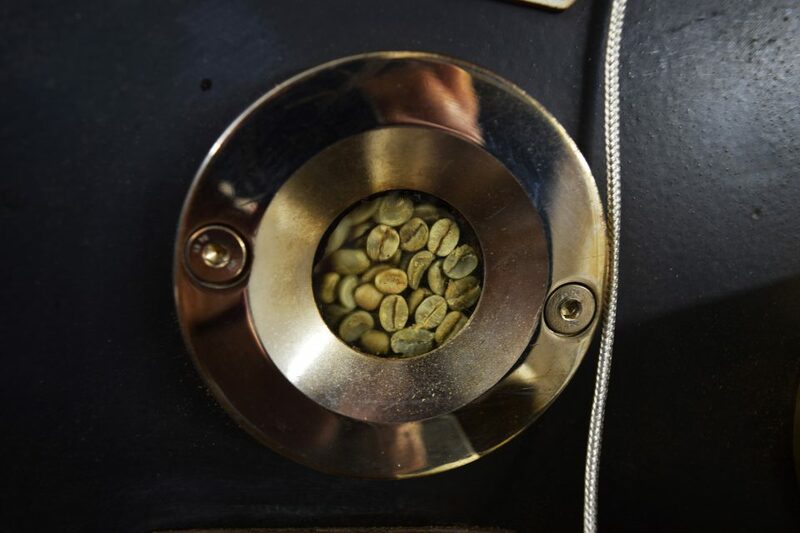 The beans will go through various different stages during the roast and slowly change from green to yellow and eventually brown as different chemical reactions take place. Once ready the beans will be removed from the roaster just before reaching perfection as they still hold their heat once tipped into the cooler. That’s taken into account when roasting so they do not over roast and become burnt. The beans are then cooled quickly on our fan powered cooling tray for around 10 minutes to reach a low temperature. During cooling the beans are stirred with a mechanical paddle to stop the roasting process carrying on and distribute the beans to evenly cool. The way coffee is roasted will have a big impact on its taste. For example, the same coffee roasted to different levels will taste quite different. A light roasted coffee will usually be brighter in taste and display characteristics of its origin, hints of fruit, citrus spice and many more. However, under roasting a coffee can produce unpleasant grassy, hoppy and hay type flavours. A darker roasted coffee will normally have more chocolatey, nutty and caramel flavours as well as deep roast flavours such as smokiness. Darker roasts are normally more bitter, with less acidity, as well as having a much fuller body. However, over-roasting darker coffees can result in a very bitter, almost charcoal tasting cup of coffee. There is a wide range of different roasts available in the UK ranging from light roasts through to the very dark. The most popular espresso/ Italian style coffees are normally a medium to a darker roast which is used often to cut through the sweetness of milk based coffee drinks. So next time you buy your coffee have a look at the roast colours and see if you can identify any differences in the flavours between different roasts. Here at Green Farm, we have a wide range of roast colours, ranging from the light filter and single origin roasts through to darker espresso roasts. So, if you’re looking to try some different roast styles we have got plenty for you to choose from!